They slow down the round, irritate your fellow competitors, and do little to improve your performance. 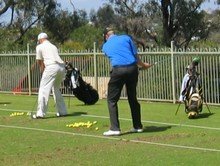 If you don't know how to swing the golf club, you should return to the range and practise until you can do so with confidence. I know you are told that before playing a shot you should follow a pre-shot routine. This is good advice, but only up to a point. The idea is that you should follow a set pattern with each shot. This helps to free up your mind so you don't slip into stroke mechanics. A pre-shot routine should be short rather than a drawn out ritual. Some professionals, especially on the Ladies Tour, now use their caddie to line them up. This is taking away part of the skill of golf. It shouldn't become the caddie's role unless you are a helper in Blind Golf. It is OK to swing your club when you are waiting on your turn to play, as long as you are not in the other player's field of vision. However, when it is your turn, you should step into the ball without delay, take a couple of waggles and then just hit it. Pre-shot routines that incorporate a full setup and practice swing with every club are slowing down the game. Golf at both the professional and social levels is dragging its feet. Big money and television hasn't helped as viewers watch tournaments where three-balls take up to five hours to complete a round. Every shot is analysed, discussed with the caddie, and often exceeds the time limit of 40 seconds set by the Tour. Now no-one who has paid an expensive green fee wants to feel rushed. Taking two swings instead of one seems a way of prolonging the round as well as reducing the cost per shot - two for the price of one idea. This logic infers that a player who shoots over 100 is getting more value for money than another player who shoots in the 80s. Setting aside the cost of playing a round, does taking a full practice swing really help? On a hot day you are using up your energy at a faster rate, so in this respect it doesn't make sense. Does it help you to play the next shot better? More likely it will put you into a conscious mode of thinking about how to play the shot. Instead of focusing on the target and reacting to it, you are now focused on what is happening at the ball. Golf is not meant to be like tennis where you have two goes to get the ball in play. For your next round try playing without any practice swings when it is your turn to play. I doubt if your score will be any worse. You may even find that it will be better.